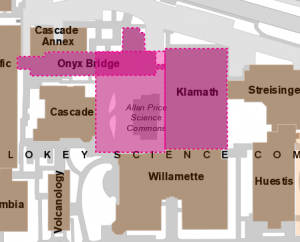 On Saturday, May 20th from 7:00 am until 5:00 pm, cooling water for supply air will be off to Klamath Hall, Price Science Commons & Research Library, and Onyx Bridge’s 3rd floor and portions of the 2nd floor. During the shutdown, spaces may increase in temperature. The duration is the ‘worst case scenario’. Crews will work to be complete early. The exact spaces impacted are: All of Klamath Hall, all of Price Science Commons & Research Library, 3rd floor of Onyx Bridge and newly renovated portions of the 2nd floor containing the conference room and IMB office.